Global smart appliances market expected to generate revenue of around USD 49.12 billion by end of 2024, growing at a CAGR of around 14.69% between 2018 and 2024. Smart appliances are conventional home appliances of next generation which are equipped with advanced features for receiving, processing, and transmitting information using laptops, smartphones, and tablets. The report covers forecast and analysis for the smart appliances market on a global and regional level. The study provides historical data from 2015 to 2017 along with a forecast from 2018 to 2024 based on revenue (USD Billion). The study includes drivers and restraints for the smart appliances market along with the impact they have on the demand over the forecast period. Additionally, the report includes the study of opportunities available in the smart appliances market on a global level. In order to give the users of this report a comprehensive view of the smart appliances market, we have included competitive landscape and analysis of Porter’s Five Forces model for the market. The study encompasses a market attractiveness analysis, wherein product type and technology segments are benchmarked based on their market size, growth rate, and general attractiveness. The study provides a decisive view of the smart appliances market by segmenting the market based on product, technology, and regions. All the segments have been analyzed based on present and the future trends and the market is estimated from 2018 to 2024. Based on product, the market is segmented into smart home appliances and smart kitchen appliances. Based on technology, the market is segmented Wi-Fi, Bluetooth, and NFC. The regional segmentation includes the current and forecast demand for North America, Europe, Asia Pacific, Latin America, and the Middle East & Africa with its further categorization into major countries. This segmentation includes demand for smart appliances market based on individual product and technology in all the regions and countries. 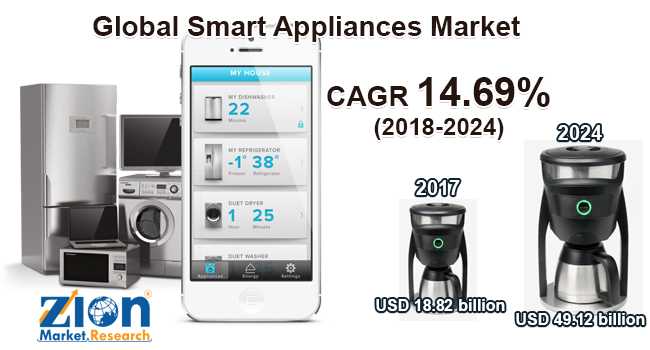 Some of the key players in smart appliances market include as Electrolux AB, General Electric Co., Koninklijke Philips N.V., BSH Hausgerate GmbH, LG Electronics, Inc., Miele & Cie. KG, Panasonic Corp., Qingdao Haier Co. Ltd., Samsung Electronics Co. Ltd., and Whirlpool Corp.